When thinking of pirates, you typically think of men: peg-legged or bearded buccaneers such as Blackbeard, Calico Jack and Barbarossa. While most pirates were men, there were many women among the ranks of pirates from the third century BC to Elizabethan England. They, too, sailed the seas as marauders, entrepreneurs and opportunists just like their male counterparts. 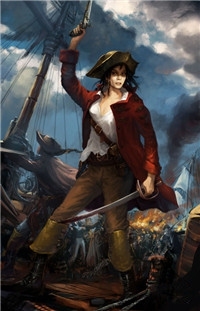 Below are just a few of the numerous female pirates of the seven seas. 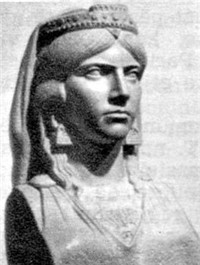 One of the first recorded female pirates, Teuta became queen regent of Illyria, located in the Balkans, when her husband, the king, died in 231 BC and her stepson was too young to rule. She encouraged piracy among her people to fight back against their powerful neighbors, namely the Romans and Greeks. Merchant ships from Rome and Greece were attacked and plundered and Illyrians captured the cities of Dyrrachium and Phoenice. A Roman ambassador was killed and after declaring war on Illyria, the Romans sent a fleet of 200 ships carrying 20,000 soldiers to take the kingdom. Teuta was forced to surrender and was never permitted to sail again. 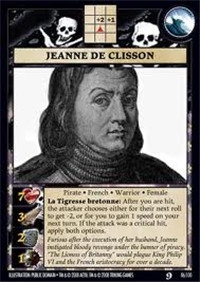 Born in 1300 and married to Oliver III de Clisson, Jeanne was a wealthy woman living in Brittany, happily married with five children. During the land wars between France and England, Jeanne’s husband was captured and beheaded by order of King Philip VI in Paris. Enraged, Jeanne sold her land and bought three warships that were painted black and outfitted with blood red sails. Her "Black Fleet" hunted and boarded ships belonging to the king of France, butchering crew members. The Lioness of Brittany retired to England in 1356, years after King Philip VI had died. With her real name unknown, Sayyida al-Hurra was married to the king of Morocco after her family was forced to flee Grenada. She was fiercely independent and richer than most, but her anger at the Christians who forced her family to leave their home led her to seek revenge. She turned to piracy after meeting Barbarossa and it proved quite profitable. She was a queen with power over the Mediterranean Sea and Christians were afraid of her. 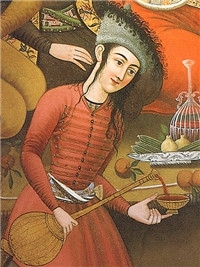 However, in 1542 she was overthrown by her son-in-law. There is no record of her after she was deposed as queen. Grace’s father was an Irish chieftain at the time of Henry VIII. He ruled a seafaring clan and collected taxes from fisherman. Grace was born around 1530 and married to Donal, who was killed and whose castle was captured. After marrying a second time, Grace raised an army and took back her dead husband’s castle from the English. She eventually took over collecting taxes from her father and soon began demanding protection money, attacking and boarding ships that refused to pay. Grace would also attack the castles of wealthy Scottish and Irish noblemen. No one can say what happened to Grace O’Malley. Anne was a criminal who was deported from France to Tortuga around 1670 where she struggled for quite a few years. Her second husband, pirate Pierre Length, was killed in a bar fight by another pirate, Laurens de Graff. When Anne challenged Laurens de Graff to a fight, he married her, instead. The two sailed together, raiding ships on the high seas and raiding even Jamaica. When Laurens de Graff was killed by a cannonball, Anne took over as captain. No one knows for sure what happened to Anne. Some say de Graff was not killed and the couple fled to America where they lived out their final days. Anne was an Irish pirate during what was considered as the Golden Age of Piracy from the 1650s to the 1730s. She had a red-hot temper. She married pirate James Bonny and was disowned by her father because of it. The couple moved to the Bahamas, in an area known as the Pirate’s Republic, but they soon divorced. 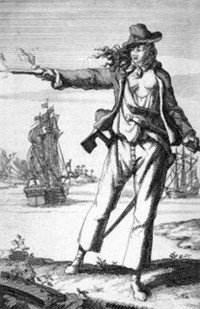 She became involved with pirate Calico Jack Rackham and became his first mate on the ship Revenge. In 1720 the ship was captured and Calico Jack was executed for his crimes. 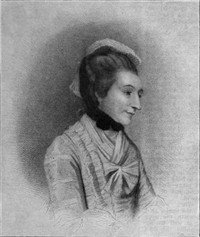 Anne was given a stay of execution due to pregnancy. There is no further record of Anne Bonny ever since. 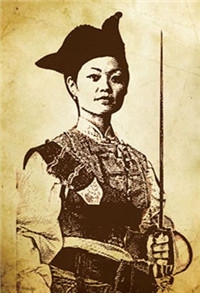 Born with the name Shi Xiang Gu, she was working as a prostitute when captured by pirates. She ended up marrying the Chinese pirate Cheng I, but his death in November of 1807 threatened to bring down his massive and fearsome Red Flag Fleet. Ching Shih took over the fleet with the backing of her in-laws as leader; the fleet grew to some 1,800 ships and over 80,000 men. Great Britain feared her as similar to her men, afraid of dying for breaking any of her rules. When amnesty was offered, Ching Shih found a way to retire peacefully with all of the loot she acquired. 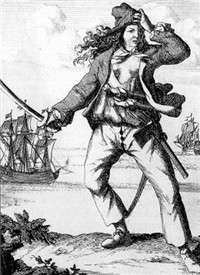 She is considered one of the most successful and feared pirates of all time. Sadie Farrell, known as Queen of the Waterfront, was an American pirate in the late 1800s, raiding farmhouses and mansions up and down the Hudson and Harlem Rivers in New York. She earned her nickname as a vicious mugger in New York City by head-butting her victims. She fled the city in 1869 after a fight in which she lost an ear, and then united a gang to help her steal a small ship. After some time, farmers began firing on Sadie’s ship as it was near the shore, so she eventually returned to New York City. Server responsed at: 04/25/2019 6:11 p.m.